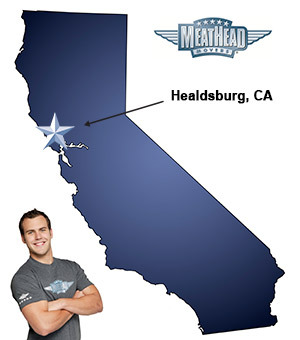 For a trouble-free move to Healdsburg, Meathead Movers is the company for you! Our professionally trained student-athlete movers are ready to get you into your new home. If you are moving to or from anywhere in Healdsburg, we are the moving company for you! Our professionally trained student-athlete movers and our moving concierge service are here to help you with every stage of your move. Nestled between three lush valleys and surrounded by over 60 wineries, Healdsburg offers a relaxing countryside charm. This northern California city is located about 65 miles north of San Francisco and rests along the Russian River where you and your family can take a dip or float downstream on a raft or canoe. Healdsburg has the perfect combination of small town charm, beautiful sights, award-winning vineyards, and a beautiful downtown plaza. Visit the town’s plaza for a variety of local shops, restaurants, tasting rooms, galleries, and bars. Take a bike tour through the Dry Creek Valley to experience the wide open spaces or take a tour of the city’s world-class restaurants. You can also check out the city’s monthly Artwalk, which highlights the vibrant art community. If you are considering a move to the area, Meathead Movers is here to help! Our moving company specializes in local, long distance, and commercial moves. We also provide reliable packing, storage, on-site relocations, and our distinctive concierge service. We have been revolutionizing the moving industry since 1997. When you entrust your move to Meathead, you can rest assured knowing that your move will be a success because our clean-cut, professionally trained student-athlete movers are the best movers the industry has to offer. Check out our reviews to see what your neighbors have to say about us! We are so confident in our services that we offer a 100% satisfaction guarantee. So what do you have to lose? Contact Meathead Movers today for a free moving quote and learn how we can help you on your next move! Moving to Healdsburg? Here are some helpful resources. They were organized, moved everything with the utmost of care, and were so polite. They were accommodating, on time, never seemed overwhelmed or distraught, and eye candy:-) Alli in all, they were perfect!! I've used a lot of moving services over the years, but Meathead Movers was by far the most professional. From the moment I requested a quote to the final transaction at the end of the move, everything was flawless. The staff was friendly, conscientious and made sure the move was stress-free. I absolutely love this company!